*Stainless steel strip core with interloked construction *Smooth Heavy Duty PVC sheath *Fully flexible with exceptional mechanical strength *Trade size: 1/4"~6"
*High tensile & crush strength. *Inner core made from a spiral Interlocked strip of corrosion resistant stainless steel. *Delikon Interlocked construction prevents unraveling under frequent bending and movements. And offering tighter bend radius. *Smooth wipe clean PVC covering surface. The PVC is keyed into the corrugations of the inner stainless steel flexible core, preventing the PVC from wrinkling when the conduit is frequently bent or moved. *Liquid tight. Complete protection against most liquids and moisture vapor. Resists sunlight, heat, oil and chemical degradation. 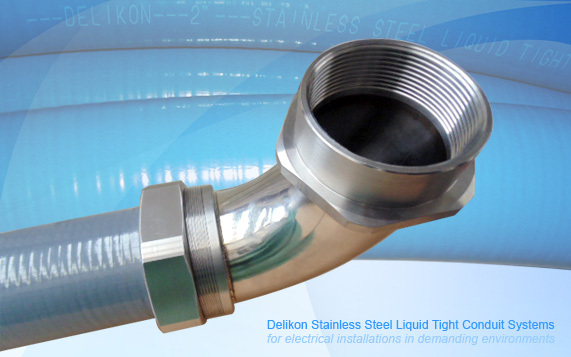 Interlocked Liquid tight flexible stainless steel conduit provides increasedprotection for wiring circuits located in extremely wet or damp corrosive areas. Used in MINING AND QUARRYING, POWER GENERATION, CHEMICAL AND PETROCHEMICAL,FOOD AND BEVERAGE INDUSTRY, WATER TREATMENT INDUSTRY, PHARMACEUTICALS INDUSTRY, TRANSPORT INDUSTRY and more. 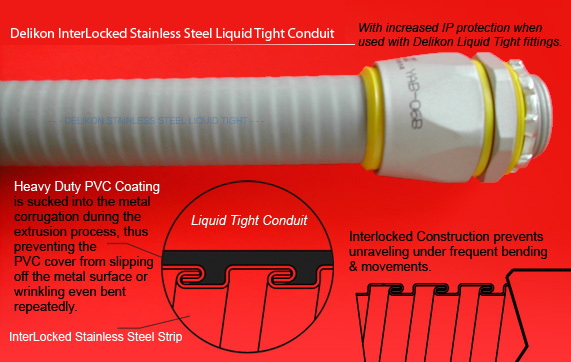 Interlocked Liquid tight flexible metal conduits with metal wire over-braid for more abrasion resistance and EMI screening. 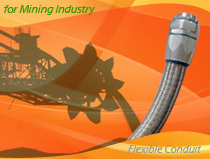 Heavy Series Flexible Sheath over braided flexible conduit for EMI shielding or abrasion resistance.